And if you still want to order something to arrive for Christmas, place it by Friday morning (Dec. 19, which just happens to be my birthday) to have even a smidgen of a chance of getting it before Dec. 25 (and choose the more expensive Priority Mail shipping option, or there’s no way it’ll make it in time). Pam and I are taking the kids to see Grandma and Grandpa, aunts and uncles and cousins, on a whirlwind driving tour. I hope that, wherever your travels take you, that you and yours have a wonderful holiday season. So enjoy the next couple of weeks, and let’s all look forward to much better things in 2009! This entry was posted in TNT on 18 December 2008 by Mr. Morrow. This entry was posted in TNT on 4 December 2008 by Mr. Morrow. On the show this month, host Chris Marshall talks with George Khoury. This December George presents us with a revised edition of The Extraordinary Works of Alan Moore – Indispensable Edition. George also talks about other hot Alan Moore related topics such as Miracleman and The Watchmen! Chris also goes over all of the December releases. This entry was posted in Tune-In and tagged alan moore, miracleman, neil gaiman, watchmen on 4 December 2008 by Mr. Marshall. “The End” for Write Now! Big announcement: After six years and soon-to-be 20 issues, we’ve decided to end Write Now! magazine. I’ve got to say, I’m really sorry to see it go; Danny Fingeroth has been absolutely professional and delightful to work with on it, and always managed to teach me (and his readers, based on the mail we get) something new about the intricacies of writing for comic books and related fields. The official P.R. about it is below, but let me just say here to all of Write Now’s readers, and the many pros who’ve contributed to the mag: Danny and I greatly appreciate all your support, and we hope you found the mag as rewarding an experience as we both did. Write Now!, the professional “how-to” magazine on writing for comics, animation, and sci-fi, concludes its six-year run with TwoMorrows Publishing this February. The final issue, #20, is solicited in the December issue of Diamond Comic Distributors’ PREVIEWS catalog, and is available for ordering now. Write Now! 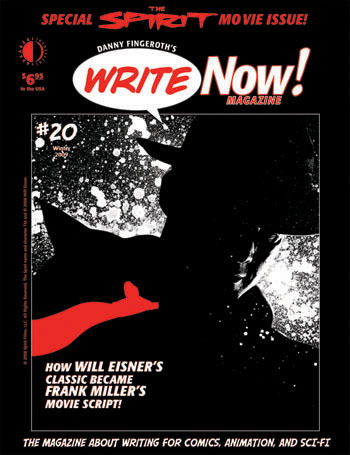 #20, shipping in late February, features a focus on the upcoming Spirit movie, showing how Frank Miller translated Will Eisner’s comics to the big screen, through interviews with key players behind the making of the movie, and a look at what made Eisnerâ€™s comics so special from a writing standpoint. There’s also an interview with Colleen Doran, writer Alex Grecian discussing how to get a pitch green-lighted, plus a bevy of script and art examples from a wide range of projects. Subscribers will be receiving information shortly regarding the resolution of any prepaid issues beyond #20, with the option of receiving either a refund, or applying their balance toward another TwoMorrows book or magazine. Back issues of Write Now! are still available from TwoMorrows Publishing’s website (www.twomorrows.com) in both print and digital form, and Digital Editions of each issue will be available indefinitely, even after the remaining print copies are sold out. Also available is a Best of Write Now trade paperback collection, and the How To Create Comics, From Script To Print book and DVD combination, co-authored by Write Now! editor Danny Fingeroth and Draw! magazine editor Mike Manley. Fingeroth plans to continue working with TwoMorrows Publishing on several upcoming projects, to be announced in the near future. This entry was posted in TNT on 3 December 2008 by Mr. Morrow.